I came late to the party on this project (as I was fully involved with the Flying Over Italy attraction for Ferrari World). 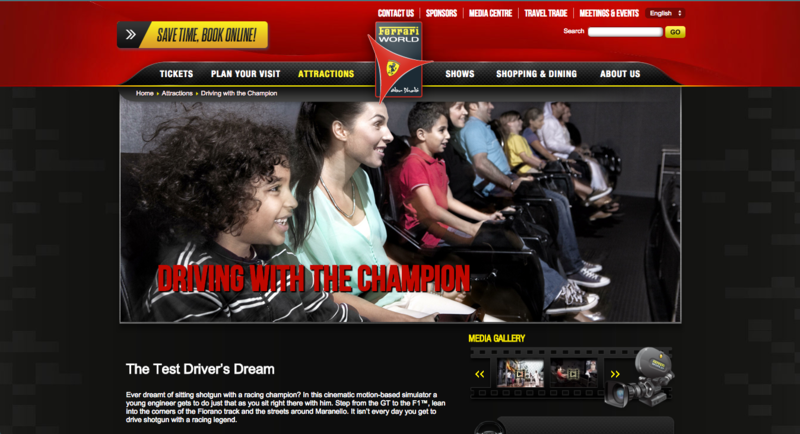 Rhythm & Hues shot the entirety of this ridefilm for Jack Rouse Associates (designers of Ferrari World Abu Dhabi). However between the time of filming and as the opening of the themepark became delayed, Ferrari’s interim Formula One driver Michael Schumacher was replaced by Fernando Alonso. Thus pick-up shots had to be gotten of Fernando, replacing all of the shots of Schumacher in the film. I was involved in the re-edit of the film as well as going on-site for the final installation and sound mix on the project.